Supreme Court orders Ahmed Tibi, Salim Joubran, and Attorney General to explain why injunction against Yisrael Beytenu still in place. Supreme Court Judge Noam Solberg issued a conditional warrant Monday forcing all relevant parties to explain why the temporary ban against Yisrael Beytenu distributing copies of the Charlie Hebdo magazine had yet to be lifted. Named in the warrant are Judge Salim Joubran, the Chairman of the Central Elections Committee for the 20th Knesset, MK Ahmed Tibi (Balad), and the Attorney General's Office. The saga over the distribution of the French satirical magazine in Israel began when Tibi and attorney Osama Baoudi filed a petition against Yisrael Beytenu and its Chairman, Avigdor Liberman, with the Central Elections Committee. They argued that the distribution of the issue, which features cartoons of Mohammed on the cover, would spark outrage in the Arab sector. Liberman, however, was adamantly set on distributing the magazine, particularly after Israeli book chain Steimatzky dropped plans for an in-store promotion of the Charlie Hebdo edition once Arab parties expressed opposition to the move. Last Wednesday, the Central Elections Committee upheld the United Arab List's petition and placed a temporary injunction ​against the party distributing the magazine. Joubran's ruling was based on the argument that the distribution would constitute election propaganda by way of giving voters a gift, which is explicitly prohibited in Section 8 of Knesset Elections Law. 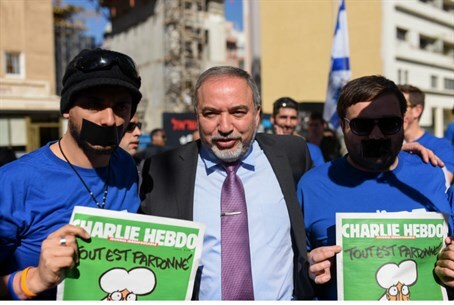 Liberman and Yisrael Beytenu immediately announced their plans to appeal, noting their intention to distribute Charlie Hebdo across Israel despite the ban. Judge Solberg stated that the purpose of the warrant was to "optimize the handling of the [Yisrael Beytenu's] petition, in view of the need to resolve it as soon as possible, without indicating any bias in favor of it." A hearing will take place in eight days in which Tibi, Joubran, and the Attorney General will need to respond to the appeal filed by Yisrael Beytenu and Liberman. After filing the appeal Monday morning, Liberman stated, "we think the decision not to distribute the magazine, by both Steimatzky and the Central Elections Committee, constitutes surrendering to threats and extortion." "I have no special sympathy for Charlie Hebdo, who has published many issues which were anti-Jews, anti-Jewish, and anti-Israel, but I always return to Voltaire's expression: 'I do not agree with what you have to say, but I'll defend to the death your right to say it.'" "That must also be our principle," Liberman stressed. "Selective freedom of expression is one of the biggest problems of the Israeli Left, and I'm sorry that no one but us is taking on this issue, and no one but us is taking on the Supreme Court. I'm sure in the end the court will accept our position."